A folksinger with a remarkable blend of warmth, emotion and range unique to the genre as well as a talented multi-instrumentalist and songwriter, combining original songs with traditional and contemporary Celtic material.
" Martyn Wylde took us to that special place that only some artists can dream to achieve." With a repertoire derived from the rich folk traditions of Ireland, England and Scotland along with his own original songs, Martyn Wylde continues the legacy of the Bards of old. Accompanying himself on guitar, bouzouki and mandolin, Martyn's pure tenor voice and three octave range combine with his multi-instrumental talent to form a truly unique folk instrument, bringing new life to material which is sometimes hundreds of years old. Martyn’s passion for the “folk songs of the British Isles” has never been more evident than on his new album The Child Ballads, Volume 1. The album features performances of eight of the compositions collected and catalogued in the mid nineteenth century by Harvard scholar Francis Child, which were published in five volumes titled The English and Scottish Popular Ballads, and which have become the “standards” of the folk music idiom. After three decades as a session and touring bassist, notably with Southern Rock group Bandit, Martyn began an exploration of British and Celtic folk music. His signature fingerstyle guitar and striking vocals were first featured with the group Wyldefyre, who recorded three albums and performed for seven years on the US renaissance faire circuit. 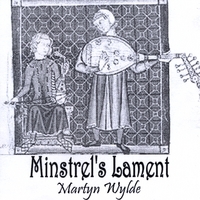 In 2009 Martyn released Minstrel's Lament featuring traditional, contemporary and original material. It is a true solo album; Martyn played all the instruments and sang both lead and harmony vocals, in addition to writing four of the songs and engineering the recordings. Selections from this album have been featured on Celtic Radio, Radio Airplay, Spotify and on the Irish & Celtic Music Podcast. Silent Night, the traditional holiday classic, was released as a single to conincide with the Holiday Season in 2013, and is available as a download on iTunes and CD Baby. Another new album featuring original compositions along with material from several contemporary British and Irish folk songwriters will be available in late autumn, followed by another volume of Child Ballads. Martyn performs solo at folk and acoustic music venues, renaissance and medieval faires, Celtic festivals, house concerts and private/corporate events, and plays bass with Celtic Mayhem.